People don’t do breakfast in bed as often as they should. Not only has it got some great alliteration going for it, but eating amid the quilts and continentals is a wonderful reason to look forward to the weekend. The thing is though that a spread of juicy, sautéed mushrooms, scrambled eggs and toppling toast stacks may not lend themselves to effortless eating. 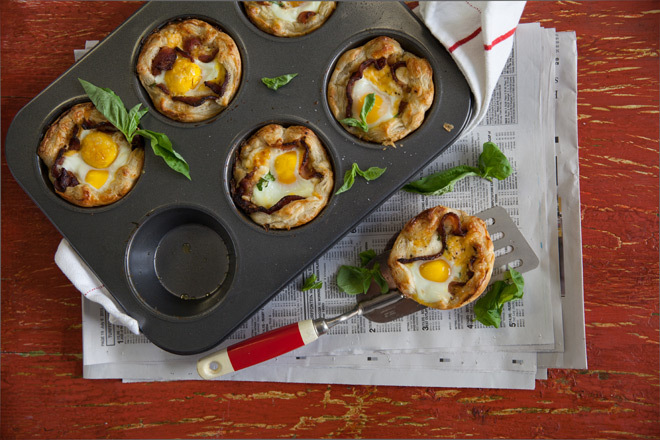 Egg nests offer a good solution – the crispy bacon and lashings of cheese, egg and all is safely encased in a shell of crispy pastry. We like these for anytime really, even on the go. Think of these as Croque Madames without the béchamel. And that’s where the ‘easy’ part comes in. They’re pretty quick on the prep and while they’re baking you can brew a decent sized pot of coffee and scamper off back to bed until the oven timer calls. You’ll have some neat eating while you watch the world outside go by. 1. Preheat the oven to 200°C. 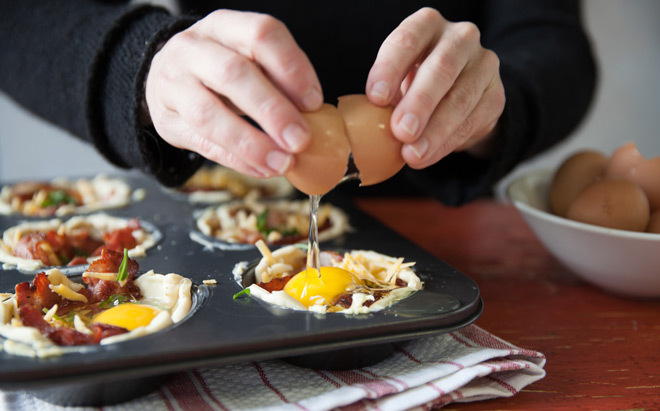 Lightly grease a large muffin pan (makes enough for 6 egg nests). 2. Cut the pastry sheets into 6 squares. 3. Gently ease a square of pastry into each muffin hole. 4. Cook bacon in a small frying pan over medium–high heat for 3 to 4 minutes or until lightly golden. 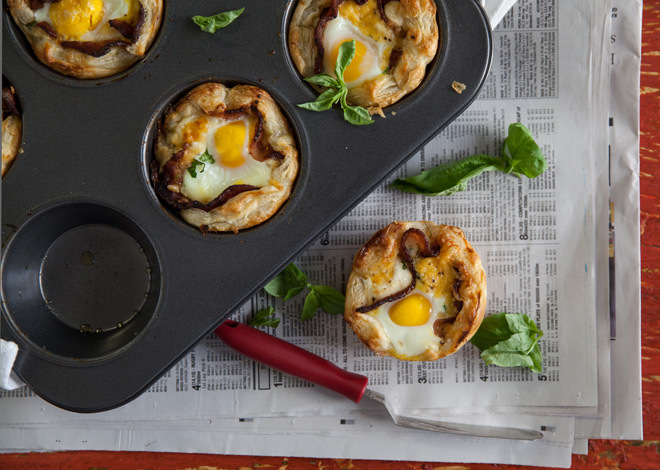 Even if your general preference is crispy bacon, don’t cook it that way for the egg nests because the bacon needs to be soft enough to line the rounded pastry cups. Crispy bacon will crack. 5. Drain the bacon on paper towel and allow to cool for 5 minutes. 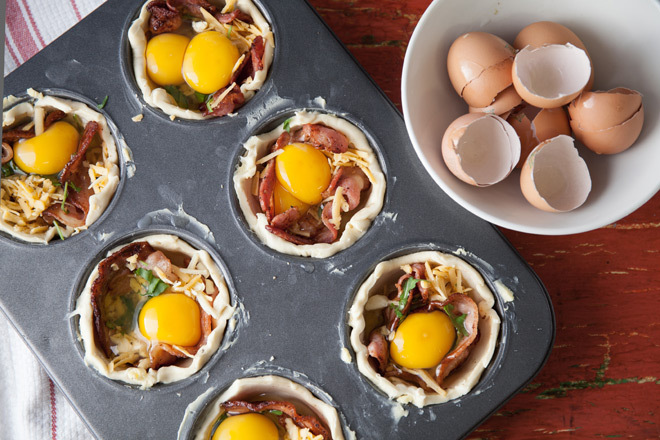 Place the bacon into the base of each pastry shell. 6. Sprinkle in the cheese and rocket. 7. Pour in milk, 1 tablespoon per pastry cup, and season with salt and pepper. Crack one or two eggs into each case, depending on how much room is left in them and brush each pastry rim with some egg yolk. 8. Bake for 15 to 20 minutes or until the pastry is golden and the filling is cooked. 9. Allow to stand for 5 minutes before removing from the muffin pan. The pastry will pull away from the sides just enough for you to pry them out easily with a fork. Grind a good amount of salt and pepper on (you’re not going to want to get back out of bed just for more pepper) and then scuffle off back to bed or out the house and enjoy this easy on the go breakfast.